Chances are, when you first went fishing, you were only a kid. You probably sat on the floor, or on an old stool or deckchair. And you probably didn’t care. However, as we get older, we need to find something more comfortable to sit upon whilst on extended fishing trips. And this begins a quest that most anglers follow all of their lives. The quest to find their perfect fishing chair. Everyone is different, we all want something dissimilar. Some prefer pure comfort, others like more freedom of movement. Regardless, we are going to give some of our top recommendations for the best fishing chair below. Each chair we present, will be included for a specific reason, which we will outline. How do we get down to that one chair that is exactly right for our needs? What are the considerations we should be aware of as we begin our search for balance between comfort and practicality in our fishing chair? Let me be clear. This might be our quest, but ultimately it will be your chair. I feel it's important to offer you the best possible tools to find the fishing chair that fits all your needs. It's true that we all have different needs and desires when it comes to getting the best fishing chair, but there are some obvious qualities we're all looking for as well. There's got to be some comfort level. Of course we want a chair that doesn't fall apart the second time we use it. We also understand that manufacturing isn't always perfect, so warranties can be a big deal. The fact that our chair will be used for fishing means it'll have to be made out of durable materials. This is our first elimination. Any fishing chair not meeting these common values is out. Let's spend that time narrowing down your preferences instead. Maybe it's a big deal to you to find a chair folding inward from three directions, like the tripod type. You prefer the way they store on your backpack for the mountain stream fishing/hiking trips. Perhaps a chair with rod holder is what you're after, because you enjoy long days of surf fishing right on the beach. Alternatively, the best carp chair, as far as comfort is concerned, could be your goal. Different chairs could be called for here, especially if you fish many areas, with varying approaches. So let's get to the meat and potatoes, and explore those options that put together properly, will result in the right mix for you. The blatant benefit of such chairs is geared towards storage and travel. The drawbacks to be concerned about might be along the lines of manufacturing. It's definitely going to take either nuts and bolts, or any of a number of innovative folding designs. Any model you lean towards should have good marks in durability. How does the folding feature work? What are the involved parts made out of? Is assembly required? If so, what does it involve? These are some of the questions that beg answering. If travel and storage are not an issue you can go with a fixed fishing chair. You'll still want to know it's durable, but the folding contraption won't be a concern. I mean you got your drink holder on one side, your rod holder on the other, and maybe a zipper pouch on back for your gear. What could be better right? But what's the rod holder made of? Is it reinforced to withstand the weight of a nice fish? How does it work paired with a folding chair? Does it make the chair a lot more bulky? In theory, the built in rod holder has great sway. Answer these questions to your satisfaction, and you just might have a winner. There's an image in my mind of a guy getting up for another beer, and returning to find his chair and rod running towards the middle of the lake. I'd make up a big fish story at that point. When it comes to Carpin', patience and stillness pay dividends. You'll likely spend a lot of time needing to sit still. Comfort may take a higher priority here. Rod holders become almost a must. Folding options again might be important to you. 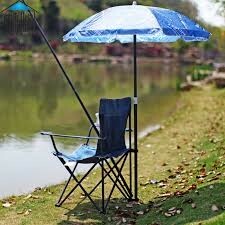 Does the chair come with a tripod stand to stabilize the long rods often used in Carp fishing? Is there an attachment for your strike alarm on the chair? Here's another option many fishing chairs offer. What's the storage like? Where is it on the chair? Does it add to the bulk, or is it built to tuck in with the chair? Storage can be a big deal too. If you already have to carry the chair a ways, it definitely adds value if you can pack your gear in it too. Let's face it. Part of our challenge as fishermen is carrying all the stuff we think we need (even though we often use only 10% of it). Yep, I put it out there. I'm guilty of it too. This will come down to a matter of what the chair is made out of. We know we don't want poor material that won't last. So does a lightweight frame use inferior material? How does a lightweight chair hold up to a big ole' boy fishing in it for a while? He's not going to collapse in the river we hope. You'll really want a lightweight feature if you're packing it in, or you have a long trek to your fishing hole. Finding a chair that doesn't lose stability or durability to get lighter is also important. Besides the fact that we want it durable, there are other considerations. Do you care about color? You might want it to blend in. What about water or fire resistance? Things to think about if you bring it camping around the fire, or sit in the water while fishing. How about the frame? It has to be rust resistant if it's going to get wet. Just think what that would do to metal hinges of folding chairs. Environmental awareness is important to many people these days. Check to see the material makeup and process of manufacturing if you like. If you choose a chair with a lightweight frame and little padding, you can use the foam sleeping bag pad to add comfort. Keep your gear in the chair's compartments when you store it at home, so it's all ready to go for next time. Never loan your chair to anyone......kidding. I'll leave that one up to you. We've gone through and taken a look at a lot of different options. We've discussed those features that we believe are important to all of us in your chair selection. Durability, some comfort, and preferably a manufacturer's warranty should all exist for us to even consider a chair. Beyond that we've recognized that we all have different needs when it comes to the features of our fishing chair. After some considerable research, we've tried to give you a range of fishing chairs that showcase these different features. We've also endeavored to give a range of prices, without sacrificing value. The inexpensive chair needs to work and last. The expensive chair better offer something that makes it worth the extra amount. If there is a fishing chair you use and speak highly of, we'd love to hear about it. We'll take a look and consider adding it to our selection. Without further ado, let's take a look at our best fishing chair selection, and why we chose each one. The Earth Products Ultimate Outdoor Adjustable Fishing Chair with Adjustable Legs is a very capable, all round fishing seat. The deep padding and high backrest make it a very comfortable chair for long fishing sessions. We also like the individual adjustable legs, which mean that even if you are fishing from the most uneven bank, you can make sure your chair is flat and comfortable. It does come with a built in rod holder, but in truth, this is not the main reason we included it on the list of recommended fishing chairs. It has a very strong frame and should last for many years. Who is this seat for? This is actually a gift that will be useful for many fishermen. Even as an extra place to sit out on a sport fishing boat. A good, high quality generic fishing chair. The Ultra-Light All Aluminum Fishing Chair with Rod Holder and Cup Holder is a very good chair for fishermen who are concerned about the weight of the tackle they need to carry. The aluminum frame is both light and strong, it has also been reinforced with a cross brace, which should ensure it does not suffer from instability even with the heaviest person sitting on it. We like the extra features this chair has. Specifically the rod holder and the storage compartments, and let’s face it, the beer holder is always going to be useful! Its inbuilt back support is also great for comfort. Who is this seat for? Any fisherman who is either fishing from a bank, or from a larger boat with room to place an extra chair. It is both lightweight and robust, a great addition to anyone’s tackle. Although not a fishing chair per se, we have included the Quik Chair Folding Quad Chair with Carrying Bag on the list for two reasons. It actually makes an excellent, comfortable fishing chair, and it is relatively inexpensive at less than $25. It offers plenty of freedom of movement, and is fairly sturdy. It also comes in its own carrying bag, with a shoulder strap. Who is this chair for? Pretty much anyone that needs an inexpensive, yet strong and comfortable chair for their fishing trips. This fishing chair is kind of an extension of the previous stool we presented. The Olive Drab Backpack and Stool Combination has the same high quality, and is equally as lightweight, but it also adds two very useful things. This is also a backpack, and it is also a tackle carrier. This adds extra utility over and above that of the simple stool. So we really like this stool/tackle carrier for roving anglers. Who is this chair for? Roving anglers who need a place to sit from time to time, and also want to carry some tackle on their back. The Alps Mountaineering Rendezvous Chair is another chair that wasn’t designed for fishing, but fits the bill very well indeed. It is extremely strong, but still lightweight. It is also very comfortable with a nice, slightly laid back seating angle. It also has plenty of back ventilation, for those hot days out by the lack or sitting by the seashore. Who is this chair for? This is a fishing chair that should suit just about everybody. It is functional, strong and lightweight, but has no extra fishing related features, which is not really a big issue.